This Ongoing War: A Blog: 30-Nov-15: Incitement to savagery costs lives on all sides so why doesn't everyone want to shut it down? 30-Nov-15: Incitement to savagery costs lives on all sides so why doesn't everyone want to shut it down? If you saw another of our posts today ["30-Nov-15: Radio that kills: silencing it"], you will be aware that incitement to killing and violence has gotten some of the Israeli government's attention in recent days and for deadly serious reasons. Incitement is expensive in terms of lives lost and ruined on all sides of the conflict. We know about the cost from up close. It might not surprise to know that we have a very personal interest in this. Our daughter's murderer, a woman called Ahlam Tamimi who was in her early twenties at the time, was charged with 15 counts of murder for engineering the August 9, 2001 massacre at Jerusalem's Sbarro pizzeria. For this, she was tried, convicted on her own comprehensive and unblinking admission, and eventually sentenced to 16 terms of life imprisonment. Along with the judgment, the panel of three judges saw fit to add an explicit recommendation: that no consideration ever be given by the Israeli authorities to releasing her early. In October 2011, she walked free, her life-sentences conditionally commuted (there were very real conditions), and went back to Jordan where she had been born and where her family live. We warned whoever would listen [via the BBC for instance, as well as NPR, Canada's CBC, Haaretz, The Guardian, CNN, Le Figaro and dozens of other mainstream media channels] that she was not done with terrorism. This proved, of course, to be right and then some. [I]n December  she was proclaimed the "Success Model" of the students at the Arab world's most important graduate school for journalists, an institution [called the Jordan Media Institute] modeled on the Columbia School of Journalism and founded by the woman previously known as Rym Brahimi who graduated Columbia and who then spent years working as an on-camera reporter for CNN. As Princess Rym Ali, she is now the king of Jordan's sister-in-law. has been on a sharply-upward trajectory. She got her own glossy television program that is beamed by satellite every Friday night into all parts of the Arabic speaking world via the Al-Quds TV channel. That's one of two global-facing television channels operated by the Hamas terrorist regime; the other is called Al-Aqsa TV. 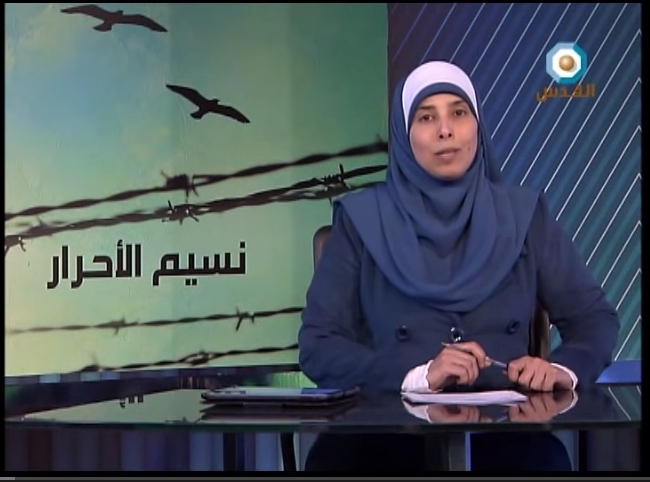 Her weekly program, "Naseem Al Ahrar" (translation: “Breezes of the Free”) focuses on the injustices allegedly visited on Palestinian Arab prisoners languishing in Israeli custody... [A]t the age of 31, this woman possesses one of the most prominent and influential platforms that an Arabic-only journalist could ever dream of having. Tamimi was the first female terrorist in the ranks of the blood-soaked Hamas jihad organization. Her undiminished enthusiasm for its barbarism is widely advertised on the web. In 1999, under Jordan's then and current ruler, King Abdullah II and shortly after the death of his father King Hussein, the Hashemite Kingdom banned Hamas. Fearing the presence of "radical Islamic elements", it accused Hamas of engaging in "illegitimate activities within Jordan" and "clandestine paramilitary training and... of penetrating local fundamentalist opposition parties". Khaled Mashaal, who today heads Hamas, was arrested that year on returning to Jordan from a visit to Iran but - reflecting the tightrope-walking for which the kingdom is famous - the Jordanian king very soon afterwards flew him by private jet into "exile". That's how he came to live in Syria for some years, before trading that for considerably more-glossy Qatar where he currently resides. adamantly denied that the [Jordanian kingdom's] crackdown had been conducted at the behest of Washington or Israel. But they acknowledged that the Palestinian leader, Yasir Arafat, had asked Amman to take action against what he saw as a dangerous source of rebellion against his peace negotiations with Israel. Quoting an Indian newspaper from November 22, 1999, one source said that Hamas leaders were warned by Jordan that "firm action would be taken if the Palestinian organization resumed its activities on Jordanian soil". Our impression is that this "firm action" has never been taken very seriously. The reality is clear in the way the Hashemite regime has consistently turned a blind eye to the production in Amman each week of "Naseem Al Ahrar", the Hamas TV show that Tamimi fronts. That has been the case for nearly four years. How difficult is it to see the evidence? It's not. The Tamimi show is easy to find and to watch, even for people living far from the Middle East. 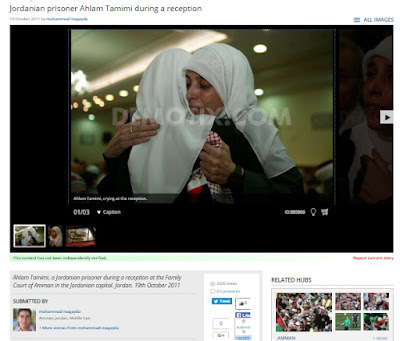 YouTube hosts an Al-Quds channel where more than 170 episodes [click to see an interactive list] of Ahlam Tamimi's weekly tribute to terrorism and terrorists are stored and viewable online, though without Arabic-to-English subtitles. We have watched many of them. With the help of Arabic-speaking friends, we have come to understand that this loathsome young woman with a cold passion for murder [view this 2012 video with English subtitles] may be one of the most powerful marketing tools in the entire murderous Hamas arsenal. We pointed out above that all the Al-Quds programming is beamed throughout the world by satellite to wherever there are potential audiences i.e. Arabic speakers. This means there's almost nowhere on earth where ordinary Arabic-speaking folk with access to satellite programming can't watch their favorite jihadist. But in the internet age, even that's more technology than a person needs. Click here to see a long list of streaming sites that will bring the same message of terrorist "heroism" and dead Jews onto the laptop, smartphone or home computer of anyone with a connection to the web. That includes the Al-Quds website itself; it's streaming live Al-Quds programming into our home as we write this. Obviously most of our readers probably don't speak Arabic. But all of us live among many people who do. In the privacy of their homes or phone screens, access to this hateful, violent programming is just a click away. The success of the Tamimi show, running for four years and going strong, testifies to those global clicks. Why does Jordan, which even now bans Hamas from its territory, allow hateful extremist Hamas TV programming to be created and up-beamed weekly (at least) from downtown Amman? If the Palestinian Authority has silenced Al-Quds and Tamimi, why does Jordan not immediately follow suit? Why do Jordan's friends, the countries with whom it has diplomatic relations (for instance the United Kingdom, Denmark, Switzerland, the Vatican, the United States, Sweden, the EU, Australia and many others) not whisper into the Jordanian authorities' ears and suggest this does not advance Jordan's interests? Ordinary folk who live in those places can easily notify their politicians and especially their foreign ministries of how repugnant it is to them that their country turns a blind eye to the Jordanian indulgence of lethal incitement. Why, knowing who Tamimi is and what she stands for, the pride she takes in the massacre she engineered, in the deaths she caused, don't those ambassadors accredited to Jordan explain to their diplomatic hosts what they already know: that the Jordanians, by turning a blind eye or (which is just as likely) encouraging Tamimi's missionizing for Hamas, are active participants in incitement to murder by their actions and by their failures to act? People are being killed. From experience, we don't have much faith in the power of petitions. We managed to sign up more than 8,000 people from all over the world in the space of three days back in 2011 when we badly wanted to stop Tamimi, our child's killer, walking free. Other than an exercise in raising consciousness, the effort was mostly a painful and frustrating waste of time and effort. We prefer on this issue to publicize our request by bringing it to the attention of the decision-makers in Jordan and in countries friendly with Jordan. We need help in doing that - help from people who understand how serious the issue of incitement to terrorism is and who care.